Nyt juustokakkuilemaan, siis leipomaan, huomenna on Aprillipäivä. Spring/Summer Vogue Knitting is here. 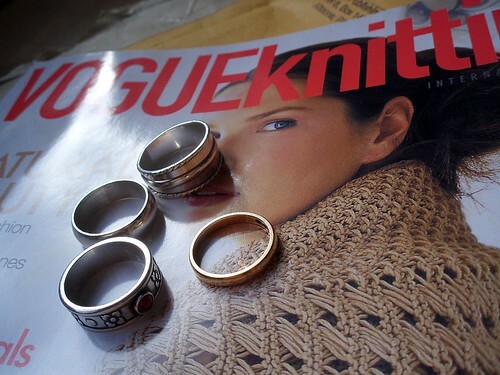 And it really is Vogue Knitting, even the international version :) And I have to say, that I like more that name. Well, preview is not in the web yet, so I won't show more, but soon. Now I'm going to bake some cheesecake, tomorrow is April fools' day. Ole niiiin kiltti ja laita sitten kuvia tanne nettiin. Ei tanne Euroopan toiselle laidalle taida saada tuota lehtea. Jooko? Saikohan ne miten paljon palautetta siitä Designer Knittingistä? Kiva jos tännekin tupsahtaa ehta ja oikea Vogue. Onpahan jotain ilmeisen odotettavaa... JEI! Nice way to celebrate. Giddi up, giddi up show and tell asap - sooo curious! Happy cheese cake making! Though have to peekaboo-check: You aint april foolin' us now? Täytyypä muistaa käydä Akateemisessa. Kauanko lehteä täytyy vielä odotella? No, tänne tuli taas se Designer Knitting, kansikuvakin ihan eri...mutta ne sukat! Aivan ihanan naiselliset ja aistikkaat!!! My copy arrived in the mail yesterday and I swooned when I saw your lovely design - had to come by and tell you. So beautiful. Congratulations!! Mine arrived yesterday - without any warning or previews on the website! Your design is beautiful, as always! I know I could knit them - just not sure I could pull it off wearing them!